VeryPDF PDF Repair for Mac is built to repair and fix corrupted PDF files in Mac computer. It supports batch process and owner password protected PDF. With VeryPDF PDF Repair for Mac, you can remove owner password as PDF password remover, and then repair the damaged PDF files. It also can remove pop-up ads in PDF files. 2. 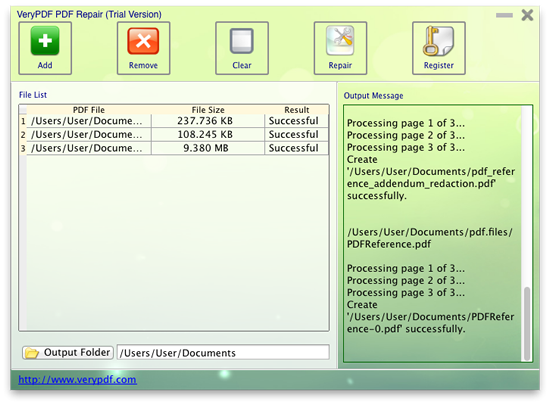 Batch process to fix multiple damaged PDF files. 3. Remove permission password in repaired PDF files. 4. Display the real time process status during repairing. 5. Remove owner password as password remover. 6. Remove pop-up ads in PDF files. 7. It supports Mac OS X v 10.5, 10.6, 10.7, etc. VeryPDF PDF Font Extractor Command Line is designed to extract font data of PDF file. With PDF Font Extractor Command Line, you can extract fonts from encrypted PDF files, save fonts to font file, or save fonts to images. Time Sheet Management System for any company. Unlimited number of users. Reports, Invoices, Data Export, Good Help, Good support. Multiplatform. Self-updating software. Lots of new features. Good for small and large companies. Very Secure.